Setting tightly harmonized Appalachian hollers atop a shifting sea of folk-pop, back-porch blues and jazz-influenced flights of improvised fancy, North Carolina’s Megafaun is the rare band that could win converts just as easily at a scruffy rock club like Emo's as it could on A Prairie Home Companion. All natives of Eau Claire, Wis., where they spent their formative years playing alongside Justin Vernon of Bon Iver in the band DeYarmond Edison, the men of Megafaun appear poised to make a similarly giant-sized splash on the national indie-scene in the near future. In advance of Megafaun’s ACL after-show with Bon Iver, multi-instrumentalist and vocalist Phil Cook talked with The A.V. Club about the harried birth of the band, embracing improvisation, and life in the South. A.V. Club: How did DeYarmond Edison’s demise lead to the birth of Megafaun? Phil Cook: The whole DeYarmond Edison experience is the classic example of "You can’t always get what you want, but sometimes you get what you need." The three of us and Justin had played in bands together since we were 16. We spent 10 years with a vision of us all making it together and now some of that success is happening—it’s just not in the package we thought it would be. After Justin moved back home [in 2006 to start Bon Iver], we all had to adjust and figure out how we were going to keep moving forward. Joe, Brad, and I didn’t really have any grand idea as to what we were going to sound like, as I’m sure Justin didn’t when he first struck out on his own. Initially, we were kind of aimlessly practicing, and then Brad was the one who really put his foot down and said "We need to line up a tour and kick our own asses to get out there." By the next practice he had already booked three shows, and we were officially freaking out. We headed out on tour with a total of four songs, but we took our time with them. We were able to stretch those out into an hour pretty easily through improvisation and that basically became our first album. [Laughs.] We really had to start over completely when Justin left because he had always been the songwriter in DeYarmond—we had to learn how to write, to sing. It’s pretty crazy that the most successful ventures for everybody happened in this really unexpected way. We’re about to head out on tour with Justin and are all really excited about getting to hang out together again. AVC: That improvisational spirit still sounds central to your approach today. PC: Definitely. We’re going to hold on to improvisation until the day we die. It manifests in different ways. On the new record, there are parts that were completely improvised on the spot alongside really carefully planned-out tape splicing. We always try and let the songs evolve and change from night to night on tour, whether that’s playing a song on banjo instead of electric guitar one night or replacing the drum with an accordion. The tighter we get and more in sync we are with one another, the more comfortable we are jumping left and right and knowing everyone else will be there. We try and keep ourselves on our toes. AVC: All of Megafaun’s members have had an extensive jazz education. How did growing up as jazz devotees and students shape the music you make now? PC: Eau Claire has a whole jazz community, and growing up in the context of that definitely leads to an appreciation of virtuosity, but that means something different as you age. When you’re a sophomore in high school, virtuosity means some over-the-top Victor Wooten bass solo whereas now I’m just as impressed by how Jerry Douglas holds two microtonal slides on the dobro. Virtuosity doesn’t really have anything to do with complexity. We still care about the technical aspects of the music in Megafaun, but it’s not like it was when we were all in school practicing four hours a day. Whenever we’re recording, we try and write beyond what we can play. There’s a song on the new record, “Impressions Of The Past,” that right now there’s no way we can play live, just because the sound is so big and there’s only three of us. We’re still trying to learn different sections of it and figure out how to pull it off live. It’s fun being able to grow into playing your own songs. AVC: You moved to Durham, N.C., from Eau Claire a little more than three years ago. Does the South feel like home yet? PC: I think there’s an element to me that was always supposed to be in the South. I feel like I’ve really planted roots here in North Carolina. I like taking my time with things and am pretty lackadaisical, and that led to me stressing out at times growing up in the Midwest. I’m not as stressed out here. The music scene here is also awesome. It’s an underdog community that’s slowly building itself up and great to be a part of. There aren’t any big cities but between Raleigh, Durham, and Chapel Hill, there’s something in the neighborhood of three dozen nationally touring bands. When we were at SXSW this year, every 10 minutes we were running into people from North Carolina. Being surrounded by that kind of drive really keeps the work ethic up. Everyone’s going for it. A ton of musicians from the area played on our album, and we play on a lot of other people’s records. It’s a tightly bonded scene. 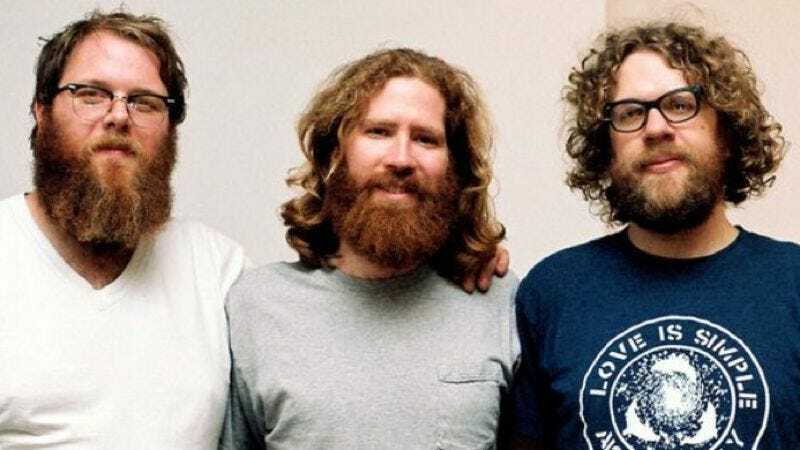 AVC: Megafaun’s served as the backing musical corps on tour for a number of artists, from minimalist composer Arnold Dreyblatt to rustic folkies Bowerbirds. How have those experiences shaped the band? PC: We never want to stop doing those kinds of tours. I’ve learned a lot from those experiences. It’s humbling to try and inhabit someone else’s songs and help lift them up by adding your thing to it. We have a tendency to become self-obsessed or just worry a lot, and those experiences really counter those tendencies. The three of us are always into different styles of music and want to incorporate different elements into the band, so the opportunity to play with other people helps us do that. My favorite backing tour was with Arnold Dreyblatt. We had to learn a whole new notation system unique to his music—we were learning some math at one point. I basically had to learn a whole new way of playing and really get into this guy’s head, who's a self-taught musical genius. I was the one most skeptical about doing it, and I was also the one who ended up getting the most out of it. It blew me away being part of those shows. We want to use this band as a vehicle for growth—and that includes music, but it isn’t limited to that.